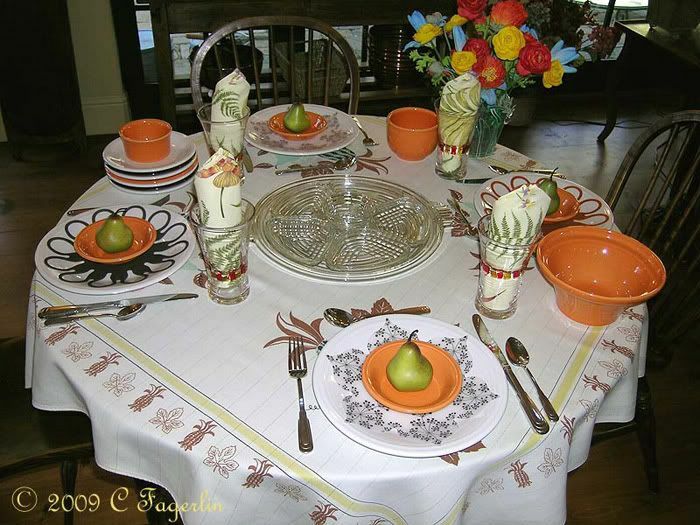 Vintage tablecloth set with Post 86 Fiesta in White, Tangerine and Chocolate. Manhattan relish tray, vase, glassware and napkins from Home Goods, Cityscape flatware. This tablecloth has appeared here on The Little Round Table before. Oooh...yet another fabulous table, my friend! 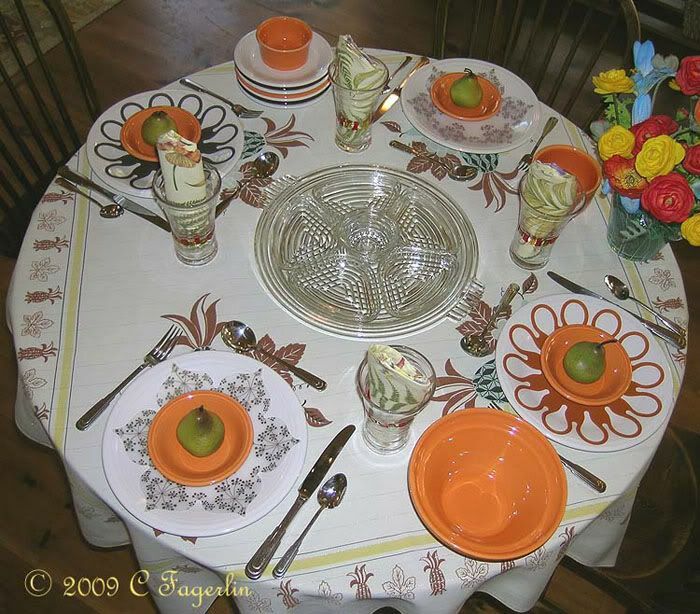 I love that tangerine fiestaware! It's such a pretty color for this time of season! 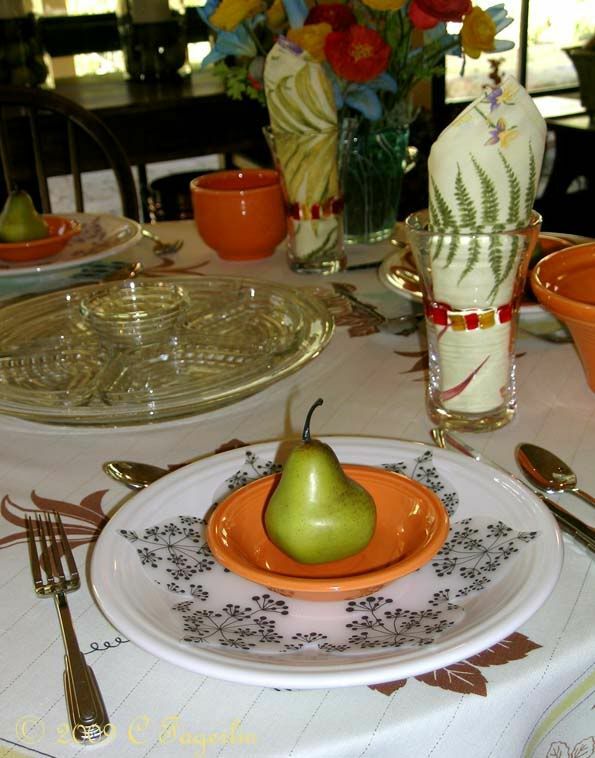 I love how it looks paired with that ironstone plate with the pretty black design...simply gorgeous! Well my friend, thank you so much for joining in with Sunday Favortes today! This is a special day for me...celebrating my "one year" birthday! I appreciate your continued support of this little Sunday meme!!! It's just lil' ol' me again! My friend, after I read my last comment I had to come back and leave another note. I realized that when I said I appreciate your continued support that it didn't quite come out like I meant it! Hehe! What I really wanted to say was that I always appreciate your support of SF, my friend! Thank you!!! And...thank you for your sweet note that you left for me...and the warm well wishes!!! Wishing you the best in my gift card giveaway, Darlin'!!! Beautiful table setting. Love the vintage tablecloth. This table looks so crisp and lovely....just beautiful. Great! I enjoy vintage tablecloths too! Happy Sunday! 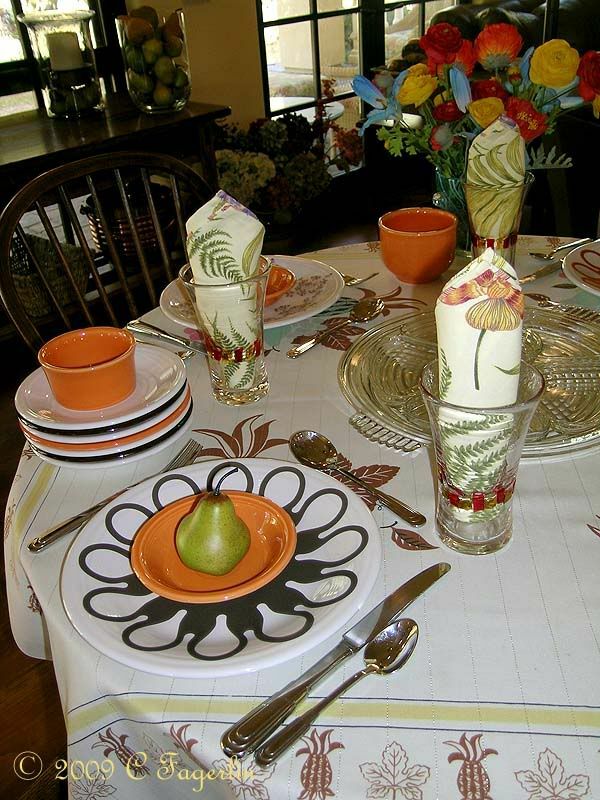 Your table looks fabulous...love the colors. Thanks to all of you for your generous comments, I do appreciate you stopping by to see an old favorite!